The City Energy Project is a national initiative to create healthier and more prosperous American cities by improving the energy efficiency of buildings. Working in partnership, the Project and cities support innovative, practical solutions that cut energy waste, boost local economies, and reduce harmful pollution. The pioneering actions of the 20 cities involved in the City Energy Project will be models for communities nationwide and around the world. 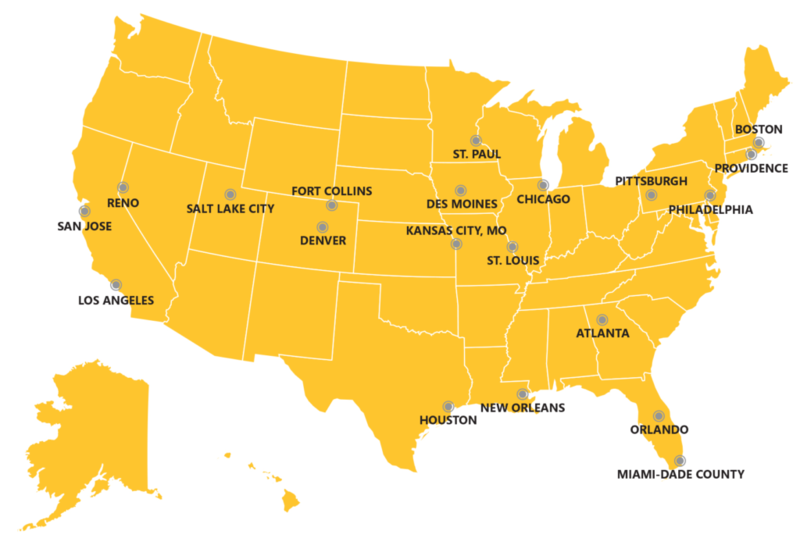 The City Energy Project cities are: Atlanta; Boston; Chicago; Denver; Des Moines, Iowa; Fort Collins, Colo.; Houston; Kansas City, Mo. ; Los Angeles; Miami-Dade County, Fla.; New Orleans; Orlando; Philadelphia; Pittsburgh; Providence, R.I; Reno, Nev.; Salt Lake City; San Jose, Calif,; St. Louis; and St. Paul, Minn. See a list of all 20 participating jurisdictions. Read our one-page fact sheet to learn more about the City Energy Project. A joint initiative of the Natural Resources Defense Council and the Institute for Market Transformation, the City Energy Project is generously supported by Bloomberg Philanthropies, Doris Duke Charitable Foundation, and The Kresge Foundation. The Project works collaboratively with each city to develop a tailored set of policies and programs that will dramatically improve the energy performance of its building stock. Cities are leading by example—ramping up the efficiency of public buildings—as they catalyze private investment in energy efficiency measures. The Project focuses on large public and private-sector buildings, which together account for a disproportionate share of urban energy use and carbon pollution. + Encourage leadership from universities, hospitals, and other major stakeholders. The City Energy Project is interested in your feedback and helping your city accomplish its building efficiency goals. Please contact us, and we'll be in touch.